Glass plate negative, full plate, ‘Potts Point and Darling Point, 1906’, unattributed studio, Sydney, Australia, c. 1880-1923. Made by Unknown (person), 1880-1923. This photographic negative was taken by an un-attributed photographer between the late nineteenth century and 1935 and is part of a larger collection of 7,900 negatives once owned by Sydney bookseller, James Tyrrell. Glass plate negative, full plate, 'Potts Point and Darling Point, 1906', unattributed studio, Sydney, Australia, c. 1880-1923. 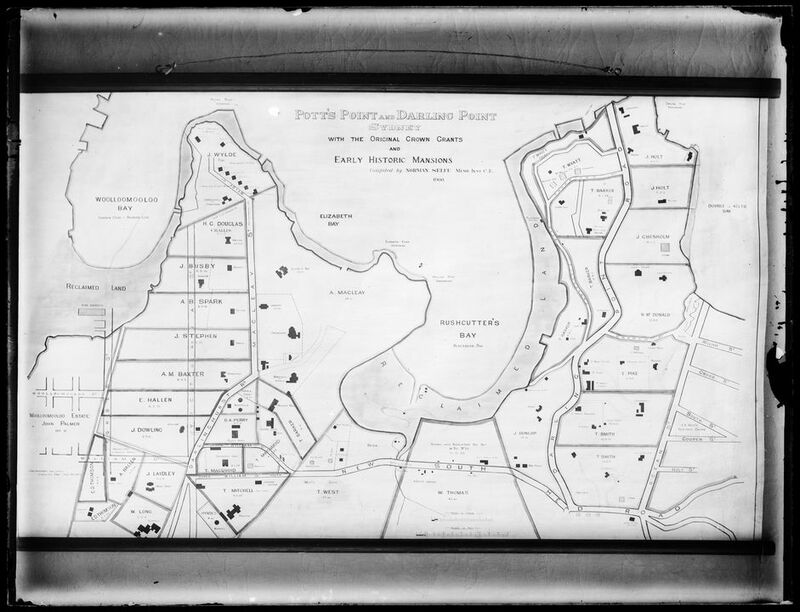 Glass negative, full plate, 'Potts Point and Darling Point, 1906', unattributed studio, Sydney, Australia, c. 1880-1923. Silver gelatin dry plate glass negative in landscape format. The Tyrrell Collection Inventory records the above caption but does not attribute the negative to a studio. 70/10 Tyrrell Inventory Number, no studio number. This negative is not attributed to a particular studio. The Tyrrell Collection of glass plate negatives dates from approximately 1880-1923. This photograph is one of 795 un-attributed photographs which are part of a larger collection of 7,900 negatives once owned by Sydney bookseller James Tyrrell. Also included in the Powerhouse Museum's Tyrrell collection are around 2900 photographs published by the famous Australian studio of Kerry & Co. (85/1284) and around 1300 glass plates by the Sydney based photographer Henry King (85/1285). While these images remain un-attributed at present it is likely that some of them were in fact part of the Charles Kerry and Henry King collections purchased by Tyrrell around 1929. There is a series of World War I portraits which have the names of the soldiers etched onto the negative but which are not credited to any particular studio but which may have been taken by Kerry & Co. studio. Amongst this group are photographs of the Sydney Harbour Bridge, taken after both Kerry and King had died, and acquired at a later date either by Tyrrell or somehow included in the material from Australian Consolidated Press. In 1985 Australian Consolidated Press donated the collection to the Powerhouse Museum. The collection at this time consisted of 7,903 glass plate negatives and 7,916 contact positive prints. Of these 493 glass plates were damaged but usable and 13 plates totally broken.